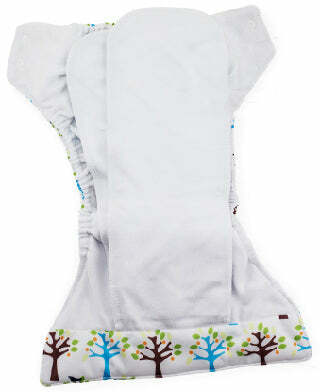 Thirsties Natural Newborn all-in-one cloth diaper with hook and loop closure is made of organic cotton and hemp. Made in USA. In a size just for newborn babies, this is an all-in-one diaper (AIO). 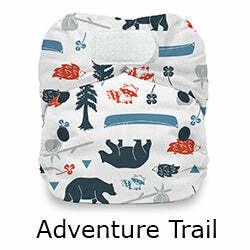 This means that the diaper cover part (waterproof outer) is sewn together into one piece with the diaper part (absorbent part). 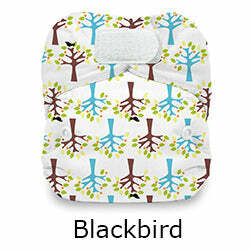 It goes on in one simple step - cloth diapering doesn't get easier. Interior consists of 8 thirsty layers of natural fibers - 2 layers of organic cotton in the body and 6 layers of hemp/organic cotton in the soaker pads. 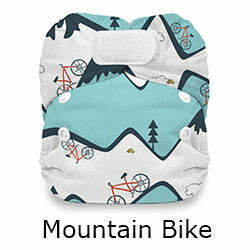 This diaper is convenient, trim fitting and absorbent. 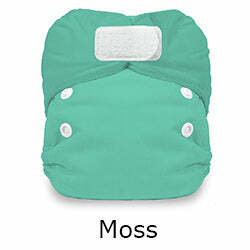 It has gentle elastic around legs and waist provide protection against leaks. (Note from Karen: The elastic actually is gentle, unlike some others that are so tight that I can't think that the overly tight elastics could possibly be comfortable for baby. This elastic is just right - tight enough to work but softly stretchy enough for comfort.). 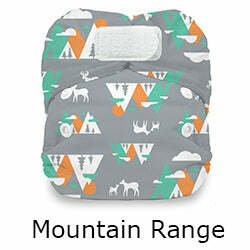 Sized specifically with the needs and comfort of a new baby in mind. Available with hook & loop or snap closure. The hook and loop closure version is on this page. Compare to the snap closure version. You can mix closures to reach the quantity discount savings. Content: Outer – 100% polyester with waterproof TPU laminate. Inner Liner – 100% organic cotton. 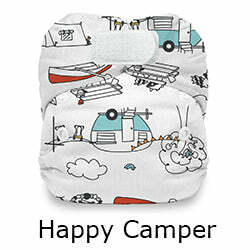 Inner Absorbency – 2 layers of 100% organic cotton. Inner Soakers – 8 layers of 55% hemp - 45% organic cotton. Made in USA. Compare to the snap closure version. Purchased these to add to my newborn stash of used Tots bots AIOs and fitteds. These were my favorite and seemed the most absorbent. They only lasted him about 5 weeks, due to absorbency, but still fit him at almost 6 weeks. I could add a doubler, but the thirsties one size natural AIOs fit him now, are very trim, and don’t require any extra stuffing. 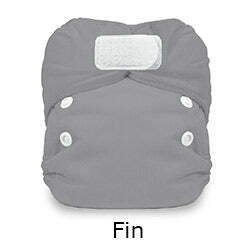 I do wish the top flap had a stay dry layer so my baby wouldn’t feel wet, which is why I only gave it 4 stars. 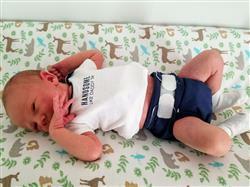 I love the fit or this newborn diaper! The applix closure allows us to get a good fit in the waist on our skinny boy. 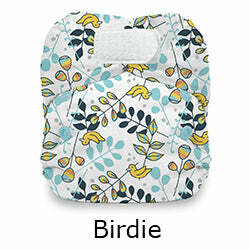 Trim, easy to use, easy to wash, love the natural fibers, velcro tabs worked great, and all parts are attached! They just ran a little small. We were only able to use them until our baby was 1.5 months old. They fit from birth (7 lb 10 oz). Works well and has a cute design. Be sure to buy some liners or doublers to insert otherwise we've had it soak through.